That was a bad close. Closed position. Waiting fallout. Sorry... I'm a bit thick... Can you eloborate on what that meant a little bit? In the charts, there's a daily candle that gets gets "saved" at closing, which occurs at 12:00 AM UTC Time. As I mentioned before, we needed a close above the target price of approximately 6780. As we did not achieve that, and instead, left behind various rejection "wicks" -- it indicated very strong resistance bulls were unable to penetrate. They made a last ditch-attempt after closing, and were similarly rejected. However, this was the second rejection -- referred to as a "double top"-- which is indicative of a failed attempt, and thus, a consequential downtrend or price drop to re-test supports -- what I referred to as a "fallout", as in a nuclear fallout ;-), not necessarily proper terminology. Thanks very much for the excellent explanation. If bulls are unable to stay above 6640, expect a decline to 6370, as it'll mark a loss of their support. As I stated before, I doubt they'll try to catch a falling knife. Head and Shoulders to 5k territory remains at play -- and gaining more validation by the hour. Things are looking very grim for Team Bull. Currently getting rejected below the required threshhold: Perhaps they can get a real bounce off 6450. Bulls touched the bottom of their channel, and made a quick recovery. The game plan seems obvious now. Bears would have had to penetrate two resistance lines, which seems unlikely in bull territory. Every single move in this region has been a bear trap. As bulls are sustaining their support, I have once again opened a new position at 6640. I expected an attack to 6750 in less than 3 hours, and perhaps settling above 6780. I'll play this one out for a few more days as tomorrow marks the weekly close, and the yellow EMA for the weekly has flat-lined. I suspect the goal will be to turn it into an uptrend within the next week or two, marking a possible bull run. If this plays out, and we reach 7k + in the next 2 days, we will need to hold a memorial for all the 6k short-sellers, begging to give away their coins at a possible bottom. Bulls attacked 6750, but fell short at 6740. They just finished retesting the bottom of their bull channel, with a 6-hour chart death cross setup to taunt bears into attacking. There was a lackluster response. The 2-hour chart reveals a perfect cup formation so we will be seeing 6780 today. On mobile and can't provide images. The cups' target is beyond 7k, which would put us above the yellow weekly EMA and signal a bull run. With the yellow EMA set to pierce the pink, it would correspond with a break across all major downside resistance. If we break through, this would bring 11k to 15k into play. All of the EMA lines are now set up for a big breakout before the day's/ weekly close, T-minus 3 hours. This is the exciting part. We have a few more clever bears beginning to close their shorts. I'd be poopping my pants too. There's a huge battle underway. Big players attempting to protect their positions. 60+ visible Bitcoin wall in coimbase. However, the second that's broken it'll send a wave of fear and short closures. I wouldn't be surprised with a shot straight to 7700 if bulls win. Even at the risk of missing out on an epic breakout, there's too much resistance, I'm taking my profit. Closing position. Reopened position with safe stop loss. I do suspect a jump to the upside, but either scenario at play: great fall or great rise which will only be exarcebated by the markets over reaction. I do believe we'll see 7k today. We are currently in a fight between downside/upside resistance points. 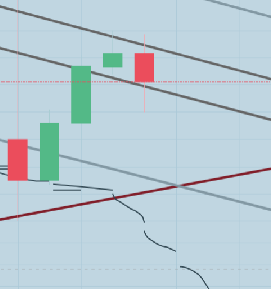 The red line above indicates a previously established, long-term bullish channel at ~6880. Bulls are hoping to get a break above 6756, and above 6880 to use this line as support, but may also be a bouncing point to the downside. I really doubt bulls would fail to capitalize on the opportunity to destroy all the open short positions. It's a bomb waiting to ignite once a threshold is reached -- it would become a race to who closes their shorts first, spiraling out of control to the upside. However, a break below this bull channel would make 6384 the next bear target. Consider the market's simultaneous wave of fear, and this would make 5500 a very near-term possibility. Yes, 5500 would absolutely be consistent with the retracement necessary for a possible overall trend shift. But with record number of shorts, bringing the price point down to that level would be incredibly "short" lived. Considering how difficult 6k has been to break for prolonged periods. Whether we're treading a falling wedge or symmetrical triangle, the fuel from short closure/liquidation would be enough to break us through it. Bearish scenario: a break below 6700 would break the bullish channel, send the price to 6600, and with shifting bear sentiment, 6384 would mark the next real possible bounce. Bulls concede their control, and we land in 5k territory. 1) We break through 7000 again, the overall downtrend continues, and we head directly into 5k territory. A drop similar to the one we saw from 8k. Forget a 6k bounce. 2) We bounce of 7000, and head directly into 8600 to mark the first higher high. The weekly MACD turns green, and continues turning green for the ensuing weeks. The greatest bear trap of all time. A bull run is here.